Compsource is a supplier of electronic supplies including hardware, software, laptops, cameras, RAM, monitors, motherboards, UPS, projectors, scanners, android phones, notebooks, chargers, televisions, home theatre systems, office supplies, gaming consoles and household appliances. The reputed brands include Schneider, CISCO, HP, Samsung, Acer, Motorola and many more. To get discounts of over 20%, keep on checking the daily price drop option and you’ll surely get some atrractive deals to take advantage of. 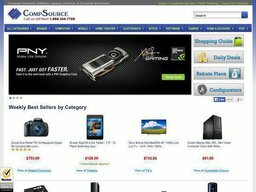 Coupofy Coupons is the leading provider of online coupon codes, so if you're looking for offers and discounts on your CompSource purchases, we're here to help! All you have to do is browse our list of coupons and when you see one you like, clicking the link will take you directly to the store where you can apply the code during checkout. In terms of shipping, there are three options available: Standard Ground, 2nd day AIR and Next day AIR. All these services are charged differently depending upon the item delivered. Expedited shipments are processed the same day from Monday to Friday and are not available for Alaska, Hawaii, US territories, Military addresses, P.O boxes and Puerto Rico. FedEx and USPS are the two courier services employed for the delivery to the locations throughout US. USPS priority mail is employed for shipment to APO and FPO addresses. Allow up to 2-5 business days for the order to reach your destination. Shipping delays may be due to result of late processing time in case you place your order after 1PM EST. All returns are accepted within 30 days from the date of shipment and they should come along with an RMA number. All such items should be in its original condition with all the slips and tags attached. A damaged box will attract a reboxing fee of $35 and be subjected to a minimum restocking fee of 15%. There are no such fees for any replacement returns, which have to be made in less than 15 days from the date of shipment. Hard drives, RAM, software, customized systems and few other items are considered as final sale, and are not accepted for return or refund. Any item received in damaged condition will be evaluated for the extent of scratch, and the refund amount shall be at the sole discretion of Compsource.